Edward Bell PharmD wrote an article in the January edition of Infectious Disease for Children discussing supplements. 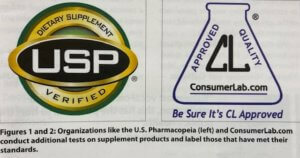 First, we should clarify what a supplement is and is not. A drug claims to help a medical condition. An infant formula carries a claim of nutrition. Both are reviewed by the FDA for effectiveness or safety. A supplement implies that it will help ‘maintain’ health, not improve it. It does not require the FDA oversight and in fact must contain a label that says: “This statement has not be evaluated by the Food and Drug Administration”. The problem is that the statement is often in small print and consumers just see the “Food and Drug Administration” and assume the product is safe. But is it? It’s hard to say. He reviewed a study of various melatonin products and found a huge variation in content compared to the label. Some of these supplement products contained other unclaimed ingredients too. Like lead, mercury, cadmium and arsenic. Fifty percent had pesticides. What can you do? Look for companies that employ an independent agency to analyze their product. The United States Pharmacopeia and Consumerlab.com will make sure that the product has what it claims to have and doesn’t have all that stuff you don’t want.